Unusual? Yes. Successful? Not so much. 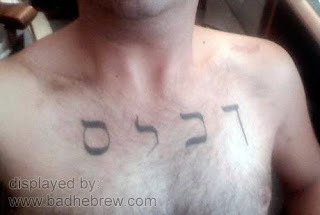 In reality, this is a combination of Hebrew letters that has no meaning whatsoever. It's just gibberish. How can this atrocity be explained? Well, it looks like one of the worst attempts ever to write the ever popular "Forgiven". If the victim was going for the traditional Salach, but wrote it backwards, got the last letter wrong, doubled it and added a Sofit for good measure, that is. Only God (and maybe a greedy translator with no scruples) can tell what this mangled Hebrew word has anything to do with "Keep Living in Sin". It could even be God's special way to inform our victim that he doesn't approve of his lifestyle, but that he can find forgiveness despite everything. It looks like the word סלחן (a forgiving man, clement, a pardoner), misspelled phonetically (סלכן) and then placed backwards, left to right (ןכלס). Have I mentioned too many times before that I love your blog? You give me *huge* joy! Thanks for it! Little kid at the beach: "Mommy, what does 'Cockless' mean?" Mom: Go ask your Abba." Once again, a tattoo best worn *under* a shirt. I second Shunra's warm compliment, btw. Perhaps it's meant to say תכלס. Which is, תכלס, a pretty cool tattoo. Thank you guys, it really means a lot! Tachles = strait to the point. I think it's SUPPOSED to be "Devils"
Looks like a backwards "סלך" which could be a misspelled "סלח". Explanation inspired by another tattoo on this site that did just that. To me it looked like a misspelled, phonetic attempt at the English workd "Reckless" (with a Daled instead of Resh). Tachles is actually the yeshivish/ashkenazi pronunciation of Tachlit. In which case it's even more wrong.